She has looped dark brown braids, brown sleep eyes and a medium skin tone, she is wearing a traditional costume. Madame Alexander brings us “Brazil”an 8-inch, fully articulated Wendy that is inspired by the beautiful country of Brazil. 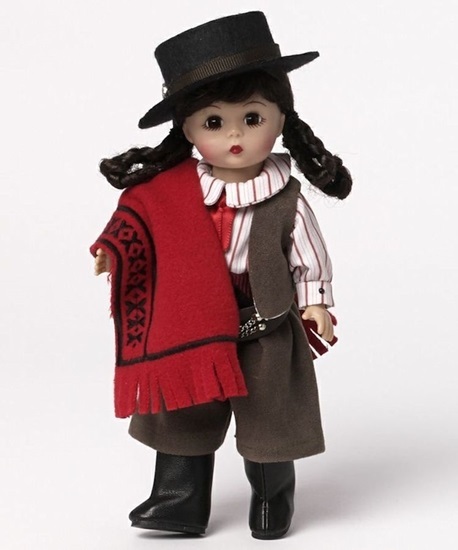 This beauty comes from Madame Alexander’s International Collection, and has a medium skin tone, brown eyes, and herdark brown hair is styled in braids that are looped on either side of her head. She is dressed as a traditional Gaucho in a white, multi-colored striped shirt that is attached to short, olive green Gaucho pants. The shirt, which has a Peter Pan collar and a black nail head detail down the front, is worn with a red necktie. Her pants have a panache with the addition of two belts, one of brown vinyl with silver chains and nail heads and the second is artfully fashioned from a red, black and white chevron print. A matching vest and a red fleece blanket, that is trimmed with self-fringe and brown embroidery on the edge, add even more flair to Brazil’s outfit. White tights, black matte vinyl, mid length calf boots and a black felt hat add the finishing touches to this beautiful interpretation of a gorgeous country.